Whether you bought the 16GB iPhone on a budget or you like to store thousands of pictures and songs on your phone, you will eventually need to learn how to free up some space. This guide will show you how to identify what is filling up your disk and how to free up space. 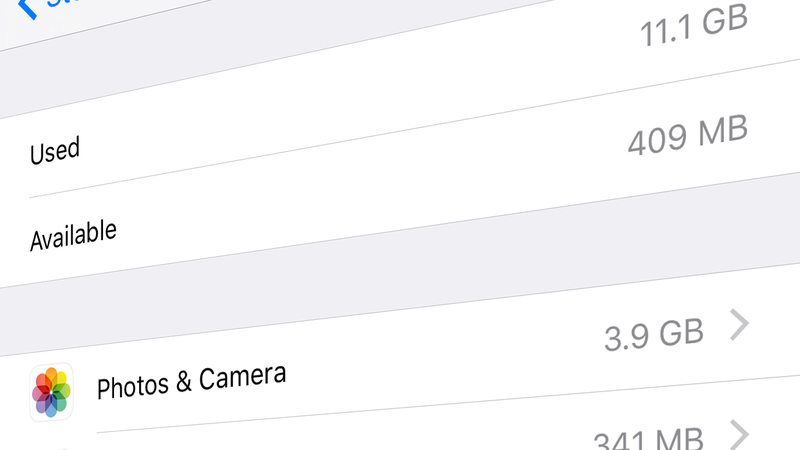 Click on the Settings App > General > Storage & iCloud Usage > Manage Storage. 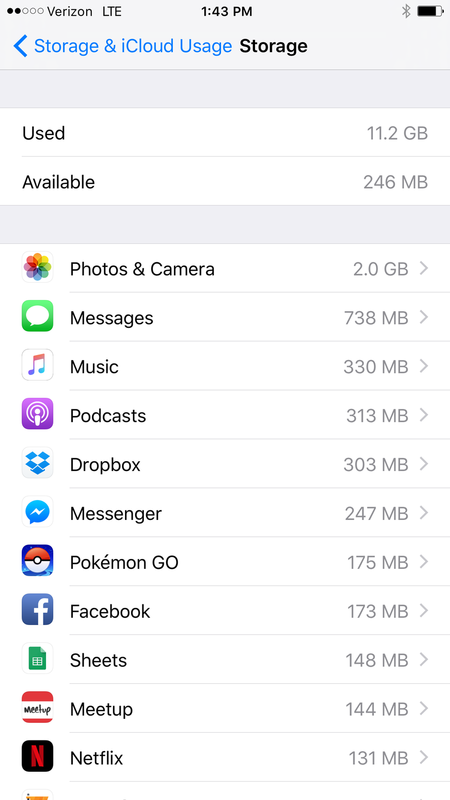 This screen will show you how much space you've Used, how much is Available, and how much space each app is using. The list is conveniently so that the apps using the most space are at the top. At the top of the list you'll find the biggest offenders. You'll probably find a list similar to mine. As a general rule, inspect apps that are using over 100 MB. It's OK for apps to use this much space, but you'll be able to reduce it or even git rid of the app. Click on the app to inspect it. Each app is different. Some apps, like Music and Podcasts, will allow you to delete content right from this screen. Other apps may only show you a breakdown of how the space is being used. Now that we know what is using the most space, we need to take action. 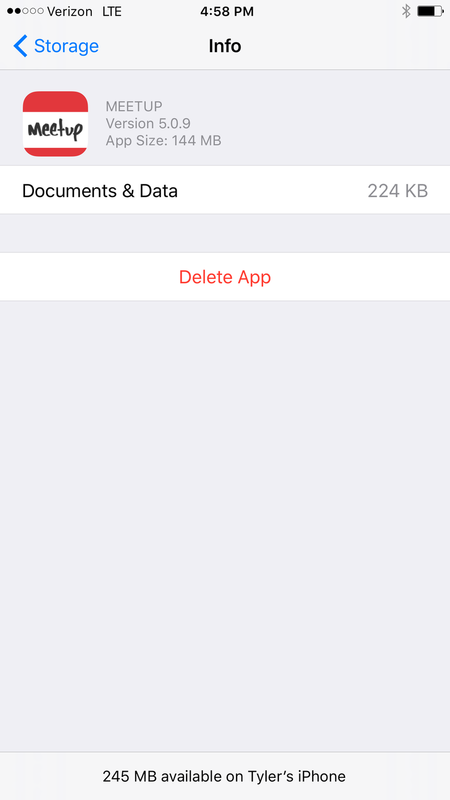 You can delete most apps when inspecting them from the Manage Storage screen. Deleting the app will free up all space that the app was using. Chances are, if you're running out of space, it's because you've got a lot of Photos stored locally on your phone. The first step here is to delete Photos that you don't actually want to keep. With the remaining Photos, consider storing them on a cloud storage service like iCloud, Dropbox, or Google Photos, and then delete them from your phone. One easy way to deal with this quickly (if you've got a Mac) is to import all of your photos from your phone to the Photos app on your Mac. You can select the option to delete all of the photos after importing them. Another big offender is your music. You can manage your music iTunes by connecting your iPhone to your computer. Delete songs you don't actually listen to. Even better, if you primarily use services like Spotify or Pandora, you may be able to delete your entire music library from your phone. This guide will show you how to block all unknown callers on iOS. Or said differently, this guide will show you how to only allow calls from people on your contacts list. Along with the benefits of mobile technology comes the risk of abuse. Whether it's a stalker or a telemarketer, learning how to block a caller can save you a lot of stress.